In order to manage service level agreements (SLAs) successfully in an organization, the service provider needs to be able to manage the SLAs with the customers in an efficient and effective manner. One way of achieving this is to group services into specific service level structures. Using the service catalogue as an aid, SLM must design the most appropriate SLA structure to ensure that all services and all customers are covered in a manner best suited to the organization’s needs. 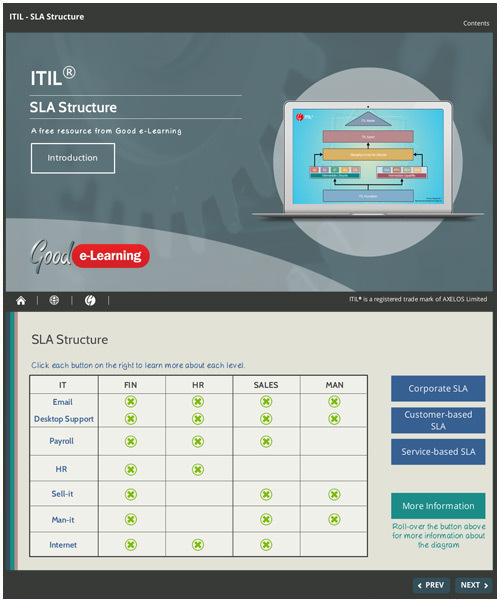 Download this free ITIL interactive guide today. Not only will you get instant access to this interactive guide but also our entire library of learning resources for free!